We need YOU! We can win in HD38, but Heather can’t do it alone! Here are a few of the ways you can help and also have fun time meeting new people all committed to the cause! Please join Heather on a door-knocking shift (or two or five)! In person conversations are one of the most effective ways to introduce Heather to voters and earn their support! Shifts are typically about 2 hours. Not sure you are ready to knock doors? Bring a friend and go out as a team! 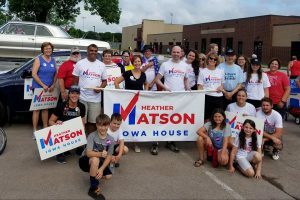 Please join us for Matson Mondays if you’d like to help make calls or write postcards for Heather! We meet from 6-8pm each Monday at the Campaign for Iowa office – 102 SE 30th Street #1, Ankeny. Volunteers can also write postcards from home! Contact our phone bank captain, Mary McAdams at mary@marymcadams.com to get involved with calls and postcards! Want to volunteer, but not sure what you want to do? Please complete this sign-up sheet and we’ll be in touch!